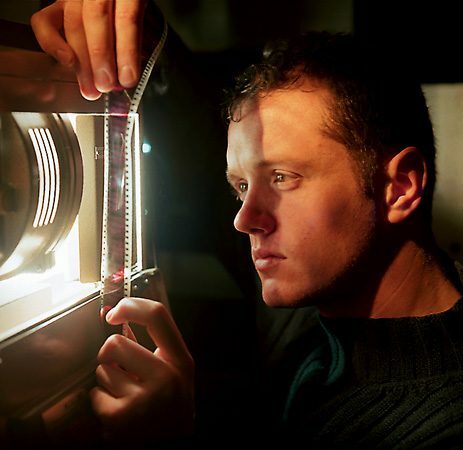 International Cinema projectionist Ryan F. Isom, ’02, shows classic foreign films to entertain, educate, and edify students. IT’S nine o’clock on a Friday night, but a steady stream of several hundred students is entering the Kimball Tower. They gather in the theater; some talk quietly, some munch on snacks, some have their arms around dates. This is no night class, no review session; this is the movies. And as the lights dim and the first subtitles appear at the bottom of the screen, it becomes clear that this isn’t a typical raucous college-town theater. This is International Cinema. “When I was a student in the 50s,” remembers Donald R. Marshall, ’60, professor emeritus of humanities, “you would see little signs announcing black and white 16mm films sponsored by one of the language departments. There wasn’t a consolidated program or series back then.” Shortly after Marshall returned to BYU in the early 1970s, this time as part of the faculty, he was put in charge of a fledgling international film program that featured one film, two days a week. Twenty-five years later, he passed this program, greatly enlarged, on to Anderson.